I completed the steps, rebooted and received Reboot and Select proper boot device. My setup was almost identical to the steps involved, and Microsoft was left in the EFI. I think this was grub 2 so I’m thinking I might need to boot to USB and update it. I figured out there was a submenu under the bios Boot menu that was still referencing the now deleted ubuntu. I switched it to Windows and it worked. Hi buddy, my friend and I installed Android 6.0 using Gpart tool and Flash Drive on a dummy Windows 10 test PC. Later we deleted the HDD volume where the GRUB files were from Windows Disk Management Tool,and upon boot up of course, we have the GRUB Loading…Error 22. Since this is just a test PC to experiment on, any method on how to fix this error 22 without using Windows Boot Disc or USB,assuming we don’t have other means to boot into Windows. On a UEFI system, GRUB files are installed in the UEFI System Partition, which was created when you installed Windows 10. If you deleted that partition, I don’t see how you can boot that system again. But you can always try booting into Windows by selecting Windows Boot Manager from the computer’s boot menu. I don’t think that would make any difference, but at least you can verify what I just wrote. This is very useful Tutorial. I tried searching for the solution in internet from 2 days. I tried so many other methods, which did not work. But now I came across your site and tried your solution. Well it worked! Thank you. Its such a compact solution for the problem. I should have come across your site at the beginning. 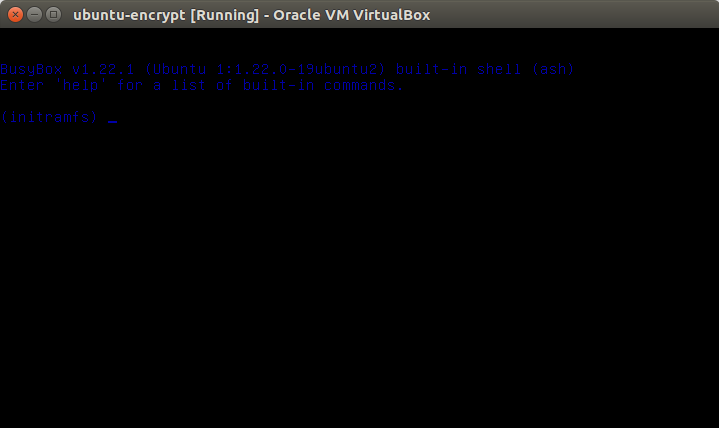 operable program or batch file. What should i do? Try the dir command instead. Well, it works totally fine. You might have done a mistake. Because of that don’t tell others not to try! I tried it just now and it works like a charm. By mistake I replied to your comment. I wanted to reply for the person who told that this is not working! Sorry..
now your procedure actually took me one step farther away from solution. Earlier i could use grub to chainload microsoft efi, now i don’t even have this, and my disk is totally unbootable. This deserves a huge ‘do not try this any more’ warning sign. You can tell from all the comments here that you’re the only person who has had an issue of this sort with this article. After executed your given commands, I couldn’t reach grub> which I can rely on “chainholder” help to enter into Windows10; The laptop automatically entered into “Setup” after reboot in every time. It looks I have to reset the whole system now. 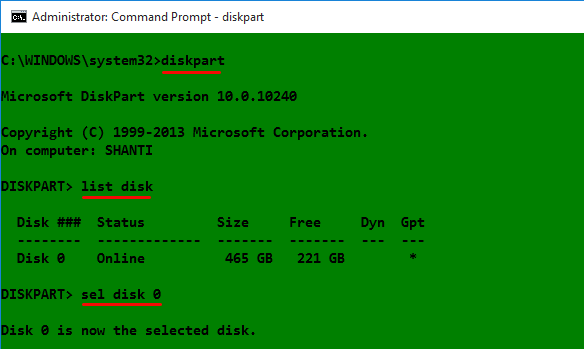 Your process of listing disks before volumes in diskpart is meaningless; the “list” command takes ‘disk’ or ‘vol’ as an argument to decide which to show you… entire drives or individual volumes. 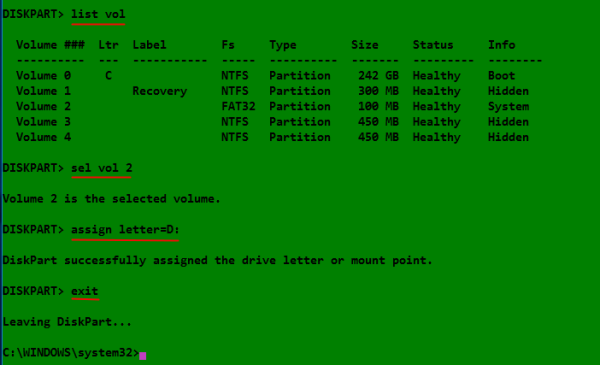 Same for “select”; it takes ‘disk’ or ‘vol’ then an integer to signify which disk or volume to select. Selecting an entire disk first has literally no bearing on selecting an individual volume afterwards; all volumes are accessible regardless. If you wanted to perform the operation on an entire disk, you would use “sel disk x” and perform the operation. Obviously here we only want a single partition, so you can just skip straight over selecting a disk. Try the dir command instead. Many tried that and it worked for them. Very helpfup guide, thank you very much! I used “dir” instead of “ls” as well and it worked. Hey, I gave new drive letter J and yeah it worked well but now it also got displayed on My Computer with memory of 256MB, so now how do I Unassign the letter? Dude you’re awesome! You just saved me hours worth of work! It definitely works with windows 10,the only catch is instead ‘ls’ use ‘dir’. Thanks again! Thanks a lot! I used “dir” instead of “ls” as well and it worked. This does not work for me. I am able to assign a letter (Z) to the system drive that contains the EFI folder, but then when I try doing “cd /d Z:” the response I get is “Access is denied”. Any ideas? hmm,i do have aquestion,what is that ls command,is not a batch or command in windows 10 : ‘ls’ is not recognized as an internal or external command,operable program or batch file. maybe u should try that again and find another thing than ls,maybe dir ? 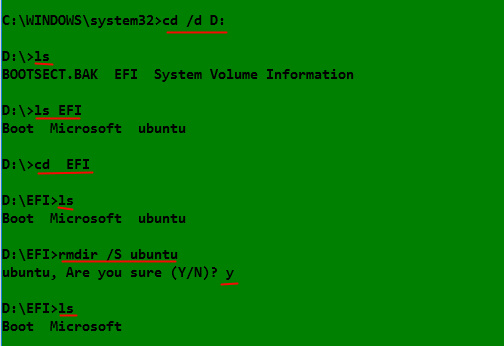 i do wander why ppl stop actually doing that or why they use something like this from maybe an older windows version ?